Some are claiming that oarfish washing ashore is a sign that an earthquake will soon follow. And this is what happened just 2 days before the deadly M6.5 earthquake hit the Philippines on February 10, 2017. So, can oarfish predict earthquakes? 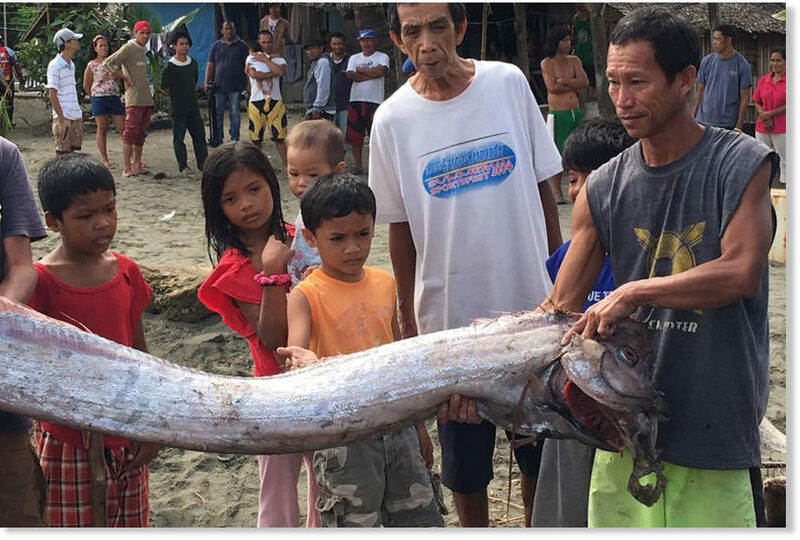 This oarfish was caught by fishermen off the coast of Agusan del Norte just two days before the deadly earthquake hit the Philippines on February 10, 2017. So can oarfish or animals predict earthquakes? 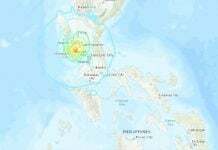 The earthquake that jolted Surigao del Norte on Friday night jogged the memory of some people on social media, who were saying an incident two days prior could’ve served as a sign for the disaster that was about to strike. On Wednesday, a 10-foot-long dead oarfish was caught by fishermen off the coast of Agusan del Norte. To some, deep-sea creatures such as oarfish that end up in shallow water are a good predictor of earthquakes. How true that is remains very much a debate? Finding a giant oarfish washed up on the beach is a rare occurrence, since the fish is a deepwater species that’s rarely seen at all. 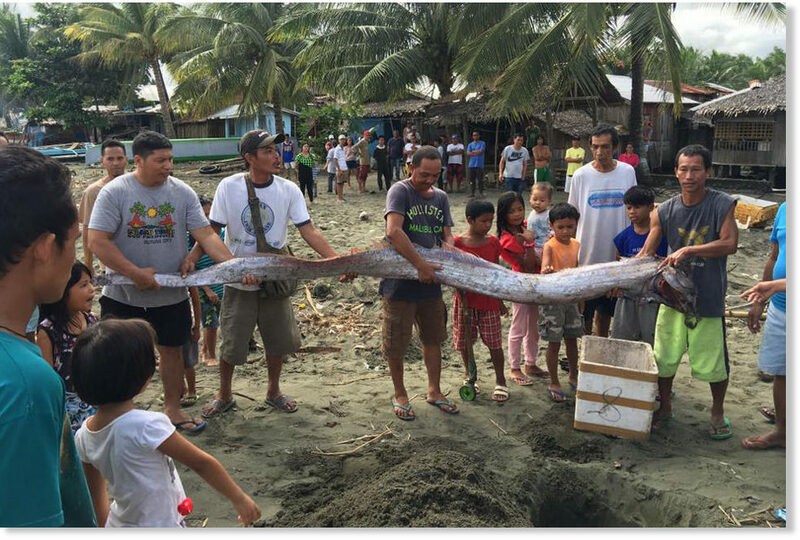 Now, some are claiming that oarfish washing ashore is a sign that an earthquake will soon follow. Shortly before the 2011 Tohoku earthquake and tsunami struck Japan, about 20 oarfish stranded themselves on beaches in the area, Mark Benfield, a researcher at Louisiana State University, told LiveScience in an earlier interview. The oarfish is known in Japan as ryugu no tsukai or “messenger from the sea god’s palace” or are nature’s version of prophets of doom. Dozens of the deep-sea denizens were discovered by Japanese fishermen around the time a powerful 8.8-magnitude earthquake struck Chile in March 2010. These weren’t the first times researchers suggested links between animal behavior and earthquakes. Indeed, there’s a long history of anecdotal reports of pets, zoo animals and wildlife acting very strangely in the days or minutes before a tremor is felt by humans. In February 1975, a 7.3-magnitude earthquake struck Haicheng, a city of 1 million people located in China’s Liaoning province. But one day earlier, city officials ordered an evacuation based in part on reports of strange animal behavior: Hibernating snakes in the area, for example, abandoned their winter hideouts months before normal. The early evacuation of Haicheng is credited with saving thousands of human lives. Zoo officials at the Smithsonian’s National Zoological Park in Washington, D.C., reported that many of their animals sought shelter or made distress calls in the minutes before a 5.8-magnitude quake struck the region on the afternoon of Aug. 23, 2010. Nocturnal snakes like copperheads came out of hiding, apes moved into the treetops and flamingos huddled tightly moments before the temblor was felt by zookeepers. If animals can sense earthquakes before they occur, what could they be experiencing? There’s no agreement on what — or if — animals can sense quakes, but there are some intriguing hypotheses. Some found that animal activity coincides with pre-seismic perturbations in the ionosphere, detected by very-low frequency (VLF) radio sounding. In research published in the International Journal of Environmental Research and Public Health in 2011, Grant and a research team found that tectonic stresses in the Earth’s crust send “massive amounts of primarily positive air ions into the lower atmosphere.” When these ions reach a body of water, they oxidize “water to hydrogen peroxide. Other reactions at the rock-water interface include the oxidation or partial oxidation of dissolved organic compounds,” the authors wrote. The resulting compounds “may be irritants or toxins to certain species of animals,” possibly resulting in the toads’ migration from an otherwise welcoming pond. 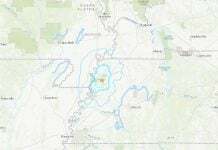 A group of physicists at the University of Virginia — investigating reports of animal behavior before earthquakes — discovered that rocks, when crushed under high pressure that mimicked the force of an earthquake, emitted high levels of ozone gas. 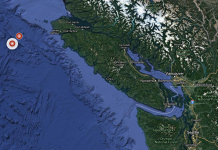 “Even the smallest rock fracture produced ozone,” researcher Catherine Dukes told LiveScience in an earlier interview. “The question is, can we detect it in the environment?” And can animals detect a sudden rise in atmospheric ozone? None of these hypotheses, however, is ready to be developed into an animal-based, early-warning system for earth tremors.